WSFI Radio reaches 54 communities within a growing market. We are the newest Catholic voice where we live and practice our faith: Lake and McHenry Counties in Illinois, Kenosha, Racine and Walworth counties in Wisconsin. Reach beyond this local broadcast area via online streaming at Tune In. Primary: Antioch, Beach Park, Fox Lake, Grayslake, Great Lakes, Gurnee, Harvard, Ingleside, Island Lake, Johnsburg, Lake Villa, Lindenhurst, Long Lake, McHenry, North Chicago, Paddock Lake, Pistakee Highlands, Richmond, Ringwood, Round Lake, Russell, Spring Grove, Wadsworth, Wauconda, Waukegan, Winthrop Harbor, Wonder Lake, Woodstock, Zion. 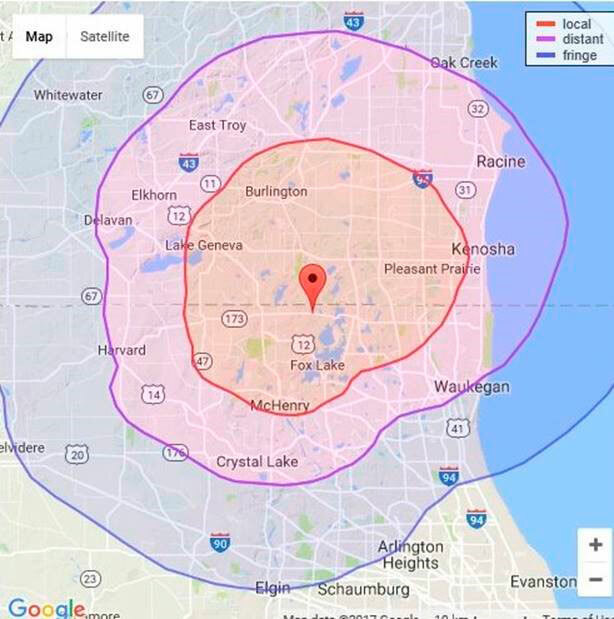 Secondary: Buffalo Grove, Cary, Crystal Lake, Lake Barrington, Lake Bluff, Lake Forest, Lake Zurich, Libertyville, Long Grove, Marengo, Mettawa, Mundelein, Vernon Hills. Primary: Bassett, Benet Lake, Bristol, Burlington, Camp Lake, Kansasville, Kenosha, Lake Geneva, Lyons, New Munster, Paris, Pell Lake, Pleasant Prairie, Powers Lake, Salem, Silver Lake, Somers, Sturtevant, Trevor, Twin Lakes, Union Grove, Wilmot, Woodworth. Secondary: Delavan, Eagle Lake, Franklin, Milwaukee, Mt. Pleasant, Racine, Rochester, Walworth, Waukesha, Wind Lake.